A notice of 10 business days shall be given to the Fire Department to coordinate tour. Requests made prior to 10 days may not be approved. Large Group Station Tour form will need to be completed as part of request. Large Group Station Tours shall be limited to 30 people. Exception: School tours that have classrooms exceeding 30 students. School tour groups must be first grade level and above and shall provide adequate adult supervision – ideally 1 adult for every 5 students. Station tours are limited to 30 minutes and shall be schedule during the following hours of operation: 10am to 11:30am and from 1pm to 4pm. Walk-in groups shall be limited to 7 people or less. A parent or legal guardian must accompany all tour visitors under the age of 18. 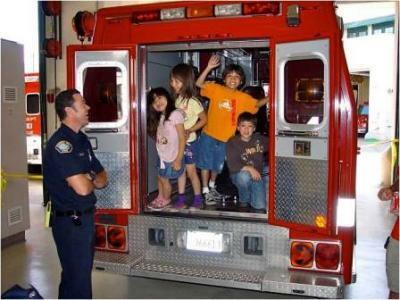 *Please Note: All Fire Stations remain in-service and available 24/7 for emergencies during tours. During the tour, the station may be dispatched to an emergency. Therefore, it may be necessary for the tour to end and your group to exit the fire station. Rescheduling tour can be coordinated.